When it comes to improving transportation options in Memphis, city planners and administrators are not the only players making waves. Neighborhood-led initiatives, innovative new businesses and citizens are putting their money where their feet are, moving the community toward a more livable transportation future. There's a new buzzword circulating through Memphis. From local residents to city planners to nonprofits, more and more Mid-Southerners are waking up to the implications of creating communities designed around livability principles. According to the Memphis Urban Area Metropolitan Planning Organization (MPO), the U.S. Department of Transportation defines livability as "places where transportation, housing and commercial development investments have been coordinated so that people have access to adequate, affordable and environmentally sustainable travel options." Last summer, local public transit agency Memphis Area Transit Authority (MATA) hired a new general manager with the hopes of increasing "livability" from a public transit angle by changing local perceptions around transit and providing an efficient, courteous, convenient, comfortable and safe product to a more diversified pool of customers. The MPO recently kicked off its quadrennial Regional Transportation Plan and named it Livability 2040 Regional Transportation Plan. It will serve as a plan of action to guide the development of transportation projects for the next 25 years. Its objective is to develop an integrated, multimodal transportation system to facilitate safe and efficient movement and address current and future transportation demand. And this is a plan in motion; the city is already tackling tough transportation improvements. After being rated one of the worst cities for bicycling, city administration has facilitated the implementation of 71 additional miles of bicycling infrastructure to its existing 62.4, with plans to total 273.3 miles by 2016. Other recent transportation projects endorsed from an official capacity are varied. An effort is underway aimed at connecting green spaces, communities and employment areas across the four-county area by implementing 500 miles of greenway trails with the newly launched Mid-South Regional Greenprint initiative. Work is being done to connect Downtown Memphis' Main Street to West Memphis' equivalent Broadway Street via the Harahan Bridge, and the test run of converting 50 percent of Riverside Drive into bike lanes is still in progress. In addition to these efforts generated by more-official constituents, local citizens, private businesses and nonprofit organizations are placing themselves in a position of influence to have a say in what they want their transportation options to look like. From crowdfunding platforms, tactical urbanism efforts large and small, and plugged-in entrepreneurs, Memphis is emerging as a city of choice by offering choices--other than personal vehicles--when it comes to getting around. 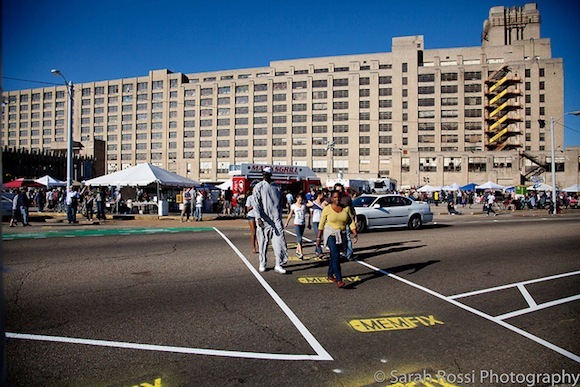 Memphis first got a taste of citizen-led transportation initiatives during its pioneer Better Block project New Face for an Old Broad (NFOB). In 2010 neighborhood residents and businesses gathered paint, planters and pluck and created their own complete street along Broad Avenue, with preserved on-street parking, protected bike lanes--also called green lanes--art-centric pedestrian crosswalks and on-street landscaping. These changes are still in place four years later, the neighborhood has become a model of livability with a bustling pedestrian and cycling culture, and the project has been branded and replicated in four other neighborhoods as MEMFix with similar results regarding the application of inclusive transportation. NFOB would not have been were it not for the idea of the Hampline. 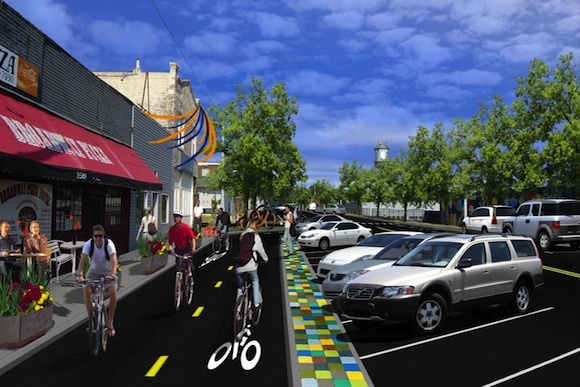 "We first approached the [Broad Avenue Arts District] to see if they would be interested in supporting a bicycling facility that connects the Greenline to Overton Park, and the Better Block idea came up," said Sarah Newstok, Special Projects Manager for Livable Memphis. The Hampline is a bicycling facility that connects the end of the Shelby Farm Greenline at Tillman St. in the Binghamton neighborhood to the East Parkway entrance to Overton Park at Sam Cooper Blvd. via Broad Ave.
Once the NFOB project proved to be an overwhelming success, momentum gathered around the Hampline, particularly in the form of funding, with federal grants and donations coming from corporations such as FedEx, from nonprofits and private donors including the Hyde Family Foundation and most importantly from the general public through the crowdfunding platform ioby. Through ioby, which has funded more than $700,000 for close to 300 projects nationwide, citizens, cycling groups, businesses, activists and a long list of supporters secured the remaining $70,000 necessary to make the Hampline idea a reality. 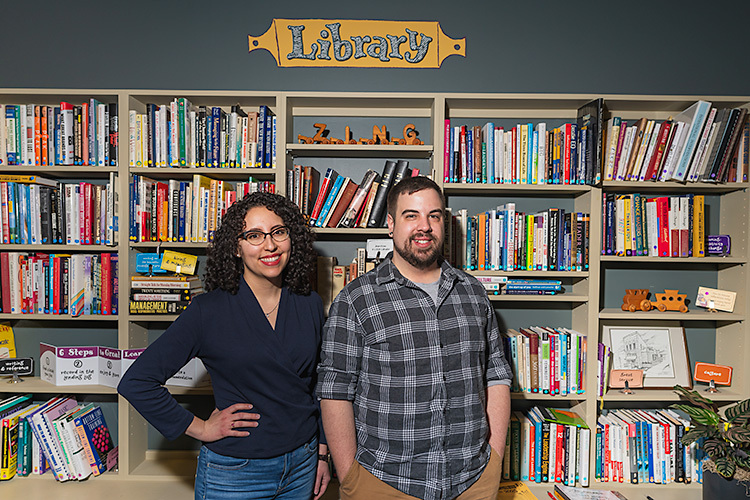 ioby stands for "In Our Backyard" and is a national crowd-resourcing platform for neighborhood-led, bite-sized initiatives to create more livable communities without all the red tape and huge dollar signs. 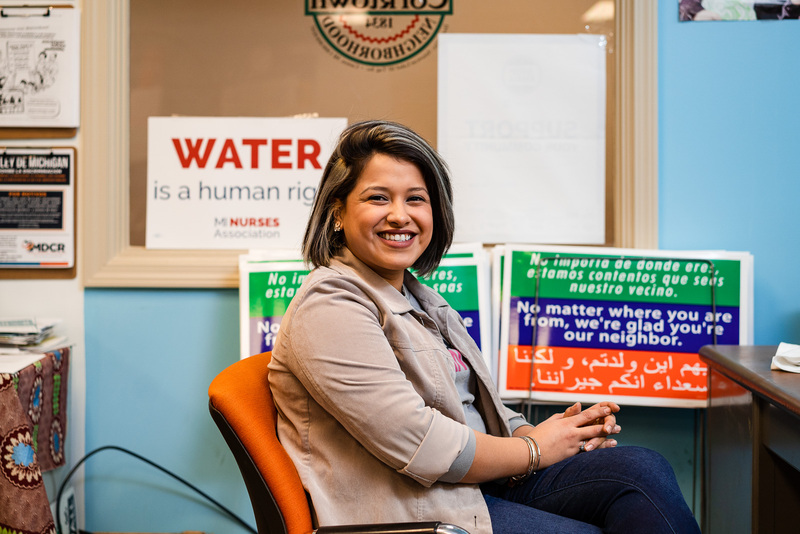 "It was such a gigantic idea, so we had to ask, 'What can we do as citizens to fill in the gap?'" said local creative placemaker for ioby Ellen Roberds. Phase one of the project was completed earlier last year with an off-street path following Sam Cooper from the Broad Ave. terminus to East Parkway and signalization across East Parkway into Overton Park. 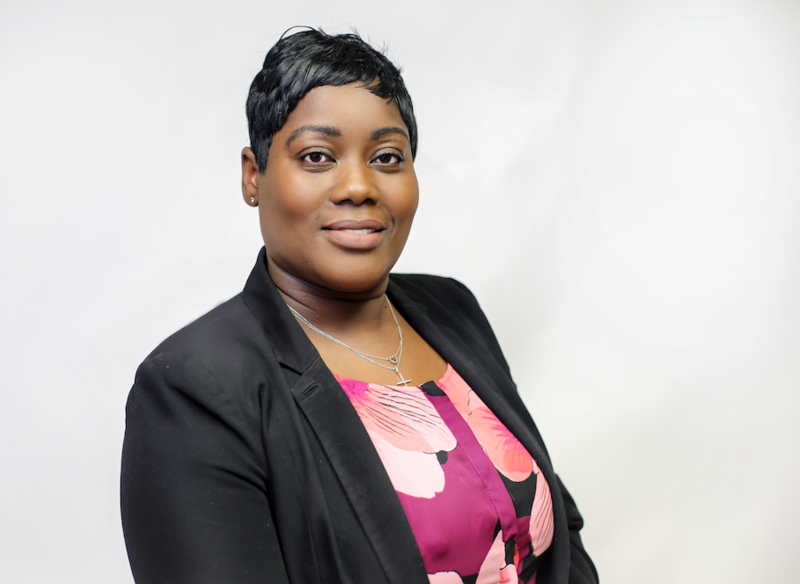 The entire project cost is close to $4.4 million and is scheduled to be completed by 2016.
ioby has been a player in several other homegrown initiatives concerning transportation, most recently the national "Trick Out My Trip" campaign. Last year the site launched the transit campaign to get local citizens engaged in making their transit experience more (you guessed it) livable. For example, Memphians proposed installing a bus stop on STAX property at the corner of McLemore and College in the Soulsville neighborhood, and raised $8,100 to do so. "Studies show that when riders feel more comfortable, they feel like their waiting time is less. This project was an important piece because it was a citizen-led placemaking project that allowed citizens to take ownership of what they want their transit experience to look like and what they use and the amenities they want," Roberds said. Bus shelter project leaders are now rallying volunteers to round up supplies and start the build in the spring. "We're really excited because MATA has shown interest in making this a test case for future adopt-a-bus-shelter projects. 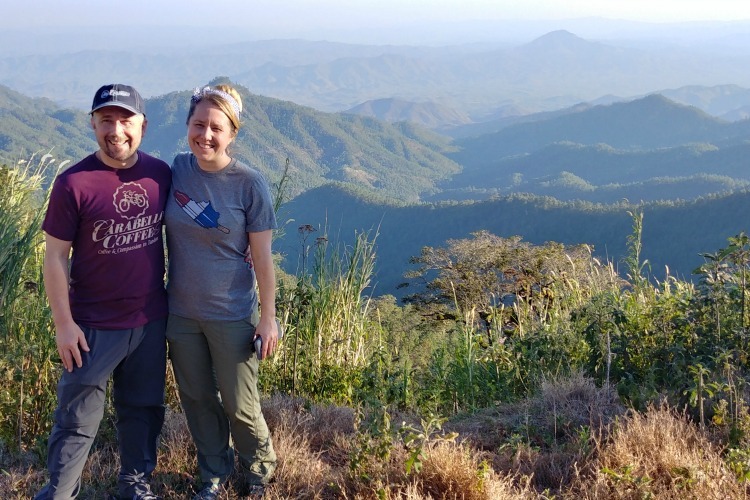 It's a great way to dig deeper into neighborhoods and build relationships and be engaged with what people want," Roberds said. "These connector points are significant, whether it's connecting a pedestrian to transit, or a bicyclist to transit. Citizens engage in travel in different ways in our city, and just think what it would be like if there were delightful bus shelters around the city with a tree or a funny quote or a Little Free Library. That's where ioby comes in, in helping to facilitate better design that makes our lives better," Roberds said. In April of last year, two ridesharing platforms that have experienced considerable success in transit-heavy metropolitan giants such as New York and San Francisco decided to join the pro-transit movement of Memphis and set up shop. Pink-mustached cars driven by locals picking up residents with the swipe of a finger became an option for those who want to be carless, through the peer-to-peer ridesharing platform Lyft, with rival company Uber offering some stiff competition. The business models allow local drivers to offer their cars for rides when nearby residents put in requests for delivery by using the app on their smartphones, which also pays for the ride. Drivers are vetted through criminal background and DMV driving record checks and in-person vehicle inspections and safety ridealongs. The companies have run into a few snags as city administrators work to create a fair market for new transportation models along with the tried and true taxi services that have been in business for decades, and deal with fees, permits and inspections. "It's important for the public and private sectors to get together on the front end to allow both to work even better, play off each other's strengths," said MPO Transportation Planner/Bicycle and Pedestrian Coordinator Nicholas Oyler. Premier Transportation Co. owner and provider of Checker and Yellow Cabs Ham Smythe IV saw an opportunity as Mid-Southerners turn more towards a car-less, pedestrian-friendly lifestyle and invented a shuttle business called Ride the Roo. 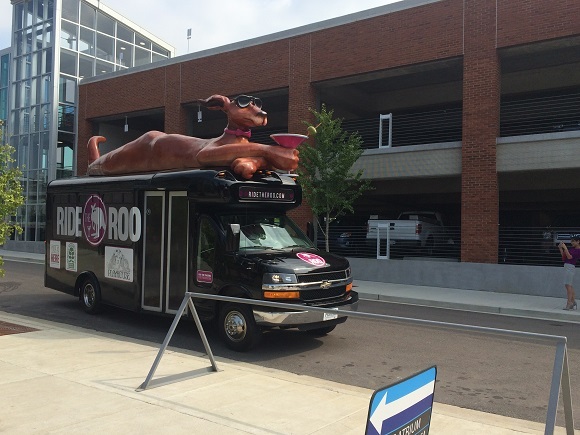 The customized 17-passenger shuttle, which features a Kern Studios papier-mache kangaroo resting atop the vehicle, offers rides between entertainment districts Overton Square and Cooper-Young for a mere $2. The 30-minute ride features 12 stops along its route and keeps more cars off the road every Thursday from 5 p.m. to midnight, and Fridays and Saturdays from 5 p.m. until 2 a.m. There are also carsharing Zipcars, which can be rented by the hour or the day, and the Memphis Hop tour bus, which carries passengers to key tourist destinations throughout Memphis and allows riders to hop on and off for $22 a day. With neighborhood-led initiatives, responses in the form of the creation of new businesses, and citizens putting their money where their feet are, it's not just city planners and administrators who are solving the problems of car-centric culture. These advocates understand such a culture is unsustainable both environmentally and financially, but they are also simply citizens wanting to live in a city with choices and are making those choices.